Our final stop in our tour of the Peloponnese was the city of Nafplio. We spent multiple days here, so we’re going to break up our activities into multiple posts. 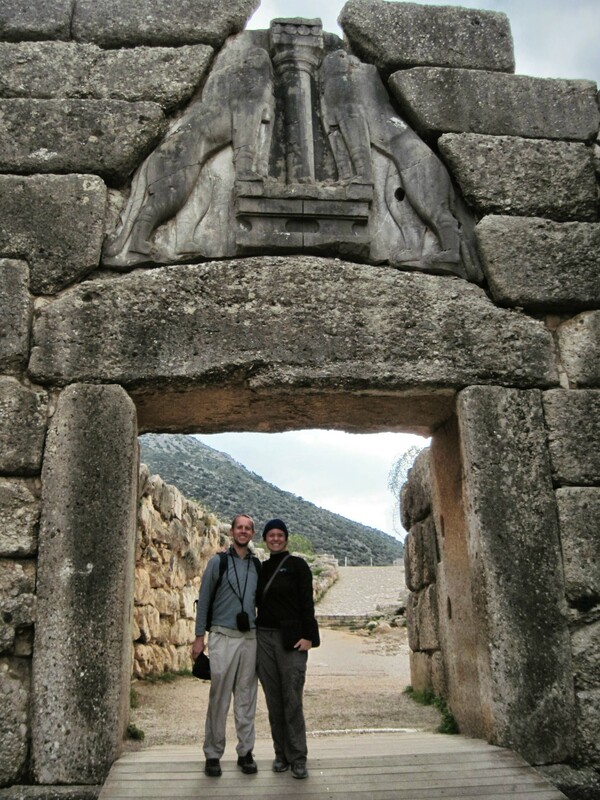 The first activity we did was a day trip to the archaeological site of Mycenae. This site contains the palace and tombs of this culture that pre-dates what we normally think of being the “ancient Greeks” by more that 1000 years! 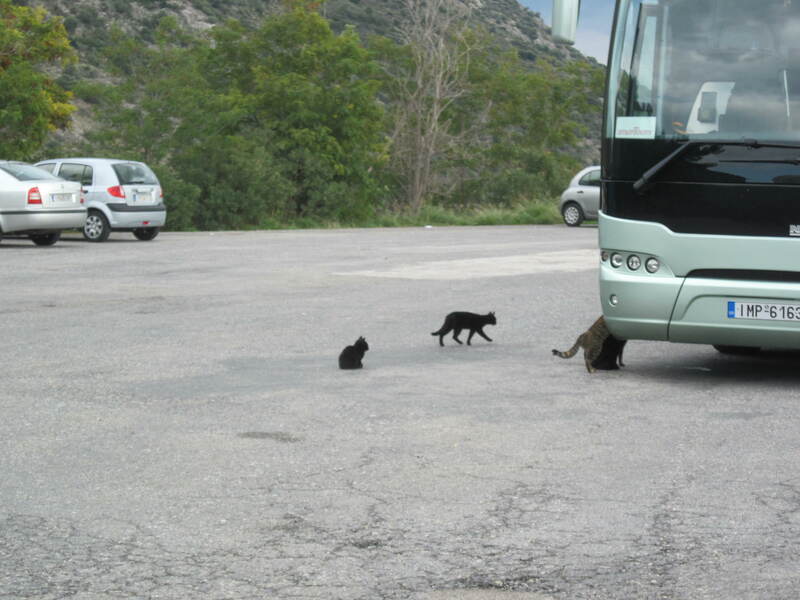 Conveniently, KTEL runs a bus from Nafplio to the entrance to the archaeological site. Since we tend to spend quite a bit of time at sites, we caught the 10:00 bus to give ourselves plenty of time. The bus was on time and got us to the site by about 11:00. So far, no KTEL drama. 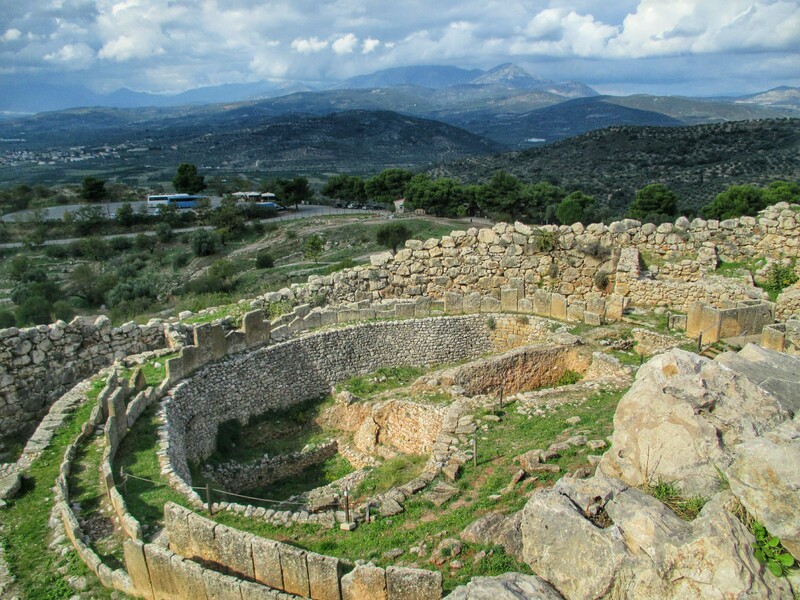 The highlight of the archaeological site is the palace of Mycenae built on top of a hill with views looking out over the valley. To enter the site, you go through the famous “Lion Gate,” named for the decoration above the entrance. This was also our first chance to get a close view at the massive blocks that made up the “Cyclopean” walls that surround the structure. Inside the gate, we found “Grave Circle A.” We were excited to see this because we had read about its excavation by Henry Schliemann in the book Greek Treasure. 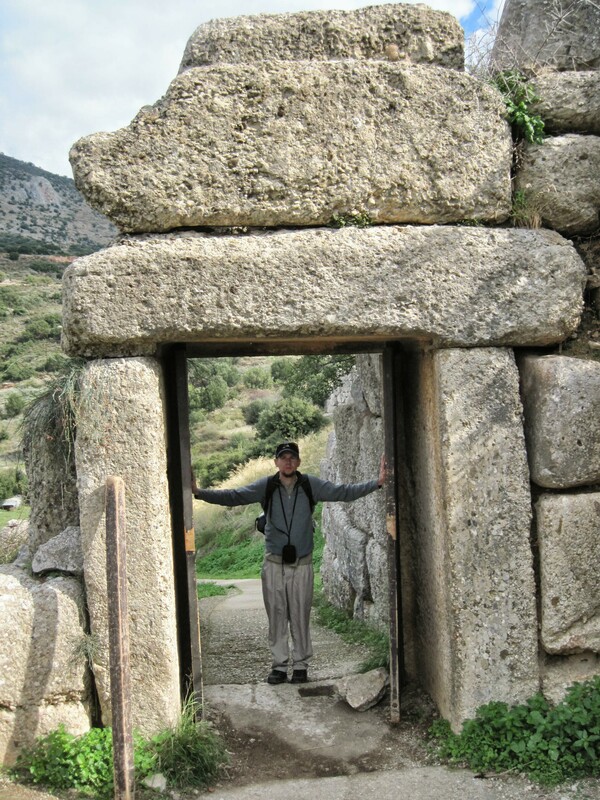 He believed that Mycenae was the home of the civilization that sacked the city of Troy during the Trojan War (using the Trojan Horse), and that this grave must have been the grave of King Agamemnon, the leader of the Myceneans described in Homer’s Iliad. Currently, the evidence seems to disagree with this being Agamemnon’s grave, but it does seem to indicate that this site is the home of a civilization that defeated Troy. At the top of the acropolis, there aren’t many structures left, but we were able to see the outlines of the ancient palace, built in the structure of a traditional megaron. We were a little disappointed that we could only see this from a distance. At the east end of the site, we saw an entrance that led to an underground well. We like caves, so we decided to explore. 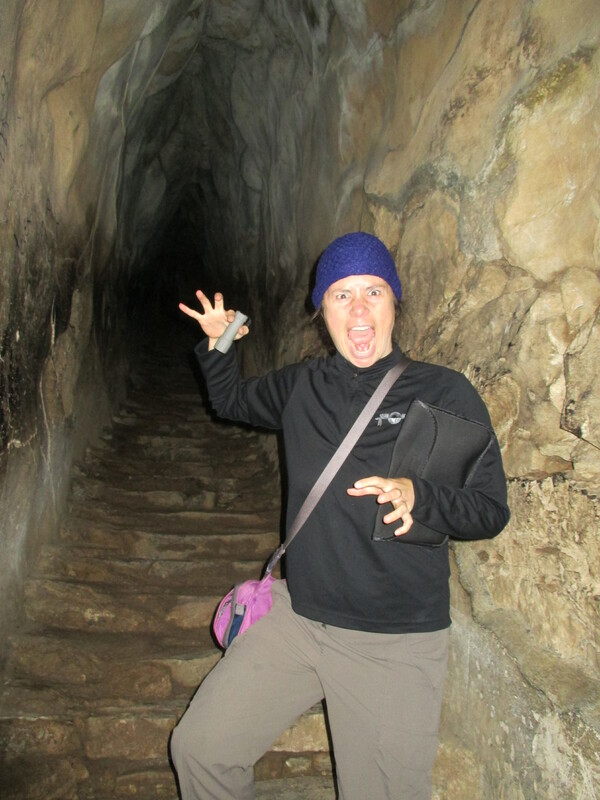 We did have a flashlight along, which came in handy as we descended the 77 steps down into pitch black darkness. It was actually Halloween, so we were a little nervous that we would encounter some scary creatures. But, we aren’t in a horror novel and we made it out safe and sound! Sure, let’s check this out. What could possibly go wrong? Back on the surface, we walked through the ruins of a few more residential buildings and then headed out the North Gate. 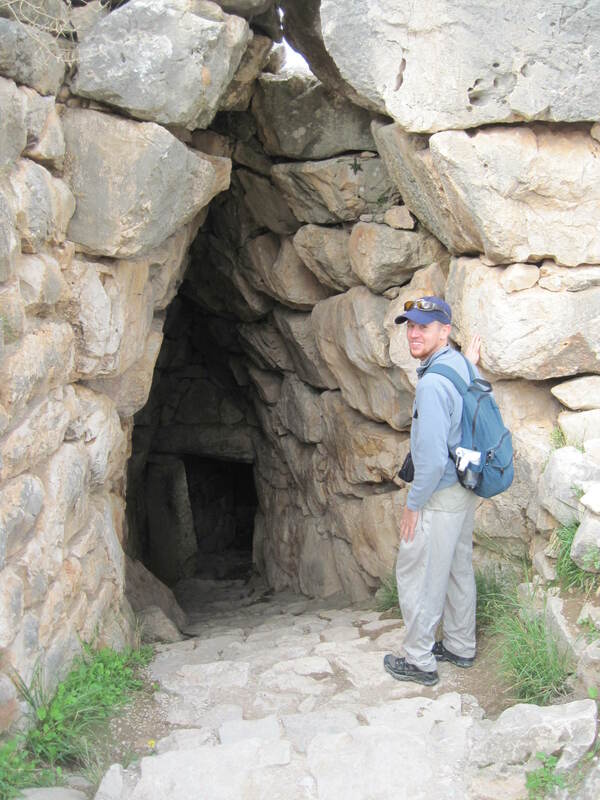 Like all of the other sites in Greece, Mycenae has an archaelogical museum at the site. 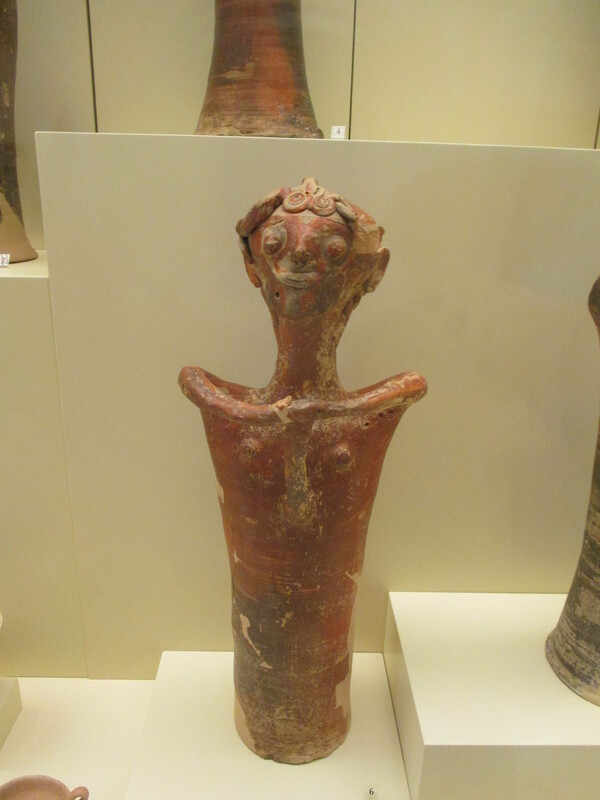 The Myceneans didn’t leave behind any amazing sculptural relics like the ancient Greeks, so the museum was a little light on content. But, it did provide a nice glimpse into the culture of these people that pre-dated the ancient Greeks. 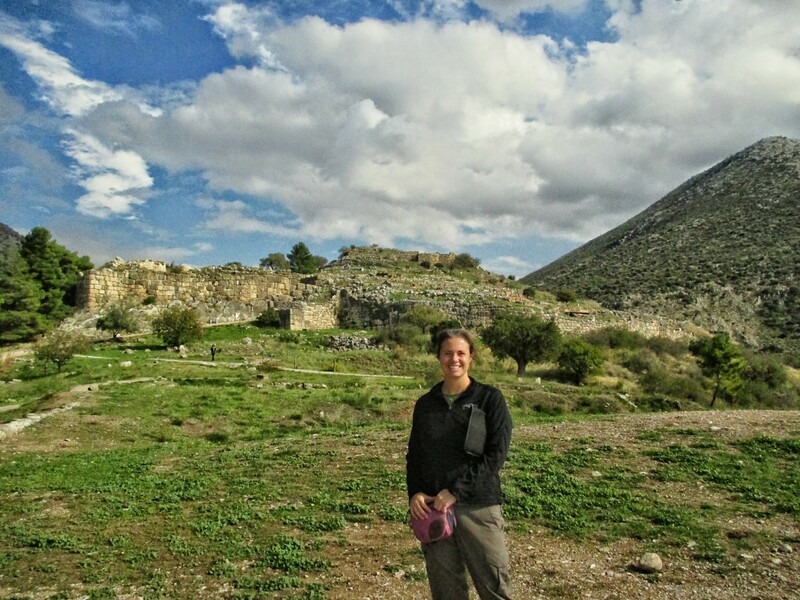 Outside of the main walls, archaeologists have uncovered a number of large tombs, called tholos tombs. These tombs are also called beehive tombs based on their structure: they are built with large, domed interiors. Some of them have lost their tombs, but two of them are still intact, including the largest, which is called the Treasury of Atreus. The entrances to these tombs are also built using the giant boulders, so it is fascinating to imagine how they managed to put it all together. We were also very intrigued by the acoustics inside of the beehives themselves. The KTEL timetable clearly stated that there was a bus at 1:00 and 3:00 leaving from the site. Since, as we mentioned, we like to take our time, we didn’t rush and aimed for the 3:00 bus. We were a little worried because a taxi driver at the entrance had implied that the 1:00 bus was the last bus, but the bus driver that dropped us off said there would be a 3:00 bus. We were in position by about 2:30, and waited… and waited… Till about 4:00… There were a few other people waiting as well, and everyone was pretty frustrated. One group pitched in to get a cab, but there wasn’t room for us. We were stuck there with one other traveler, who turned out to be a fellow American. Luckily, he had a local friend who graciously offered to pick us up and take us back to Nafplio. We aren’t sure what we would have done if she hadn’t agreed to take us as well! A couple of questions. 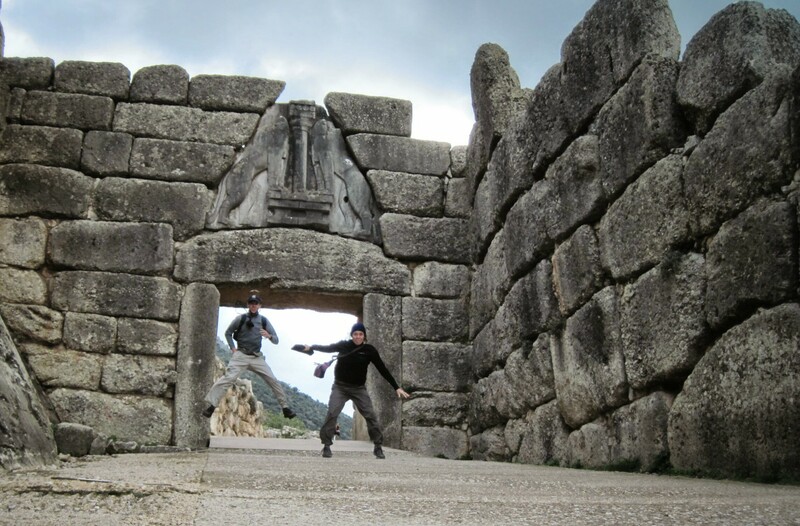 How far was Mycenae fromNauphlio? also, was the next day a national holidays such that there might have been an explanation for the last bus being cancelled? Still doesn’t explain the misinformation from the busdriver however. In a selfish way, I am glad you also had some trouble with the busses. We felt so stupid when we travelled years ago that we didn’t get to some sites at all because we couldn’t ever figure out the bus schedules. . I think it’s about 30 km away. As far as we could tell there was no holiday. It is low season, but we thought we had taken that into account by having the correct dated schedule and talking to the bus driver. We still have no idea why it happened! WE remember the lion’s gate but not much else. Fun to read.